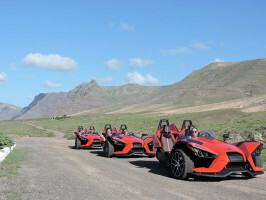 What better way to explore the unique volcanic landscapes of Lanzarote than by riding an adrenaline-fueled Polaris Slingshot? Really become a part of the exotic lifestyle of the Island, whilst taking in all the most exclusive and hidden places whilst the breeze rushes through your hair. 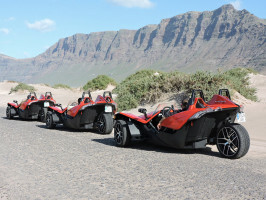 Discover the best places in Lanzarote driving these superb vehicles, see small, local villages and see a lot of locations which are unknown to many tourists. With 3 different routes to choose from, varying in duration, there is a perfect tour for everyone. Along the way there will plenty of photo opportunities to capture the breathtaking scenery. If you select route 3, a delicious lunch is included to recharge your energy from all the excitement. Volcan Tour: short south tour of Lanzarote. 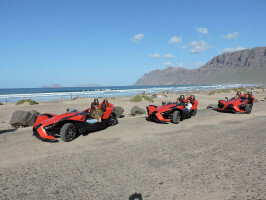 Grand Tour: La Geria, Mozaga, Famara Beach, La Santa, Timanfaya, Yaiza, Salinas de Janubio, Los Hervideros and El Golfo. 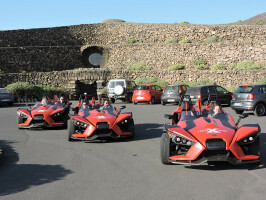 LanzaXtreme Tour: La Geria, Teguise, Teseguite, Cactus Garden, Punta Mujeres, Haria, Mirador de Guinate, Famara, La Santa, Timanfaya, Los Hervideros y El Golfo. 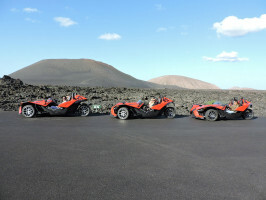 This truly is an unforgettable journey: see Lanzarote from a whole new perspective. 7 years to participate, 21 years to drive. 2 people on each trike. Lunch included only on Route 3. Pick-up from hotels in Costa Teguise, Arrecife, Puerto del Carmen, Puerto Calero and Playa Blanca. Please call 24 hours in advance to confirm the pick up time and location. Driving License type B required. Drop-off location: At the same place of the pick up. Guide/instructors speak: Spanish and English. Please ensure you arrive at the meeting point at least 15 minutes prior to the tour start time. Voucher validity: Voucher valid for the date of service only. Remember to bring the voucher and valid photo ID with you. Passengers must be 8 years old or older. Driving License type B required. 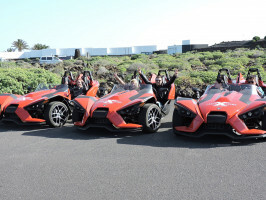 You must have a driver’s license in order to drive a Slingshot. Modality driver and companion: prices for 2 people by vehicle. Only one companion is permitted per driver. *Should an emergency arise, please call at the next telephone number: +34 971 211601 - 24 hours (Languages spoken: Spanish, English).